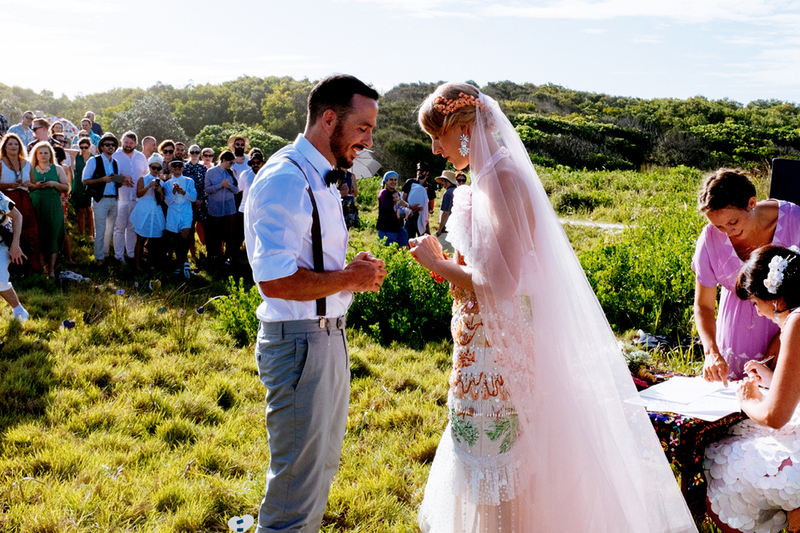 Jaala and Tyler first met at Splendour in the Grass, so it was their first choice to come back to Byron Bay region for their destination wedding at the beautiful Byron Plantation in Newrybar. Vow Cards or Repeat After Me? Vow cards, or repeat after me... It's up to you, and rather than presenting this as a pros and cons list, I'm just going to tell you the good things about each choice, and you can weigh up what works best for you. 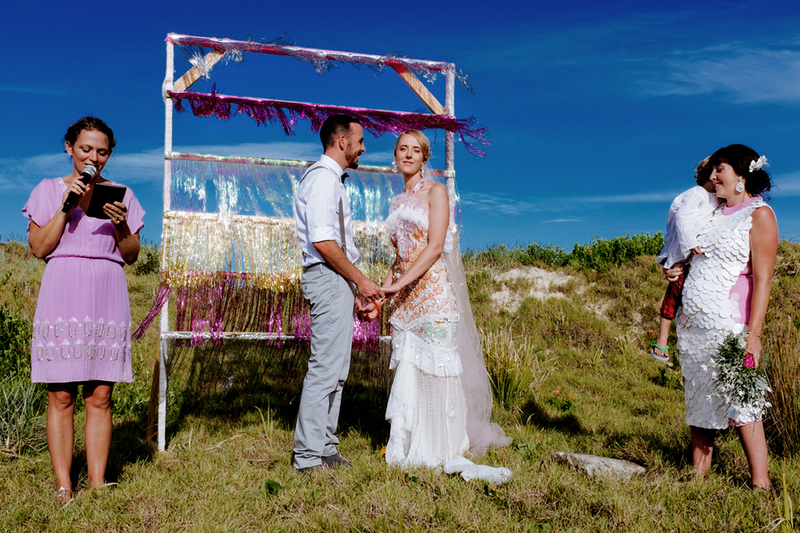 Earlier this year I had the immense pleasure of marrying Hendrika and Anthony, better known to all their loved ones as Rikki and Noodle. 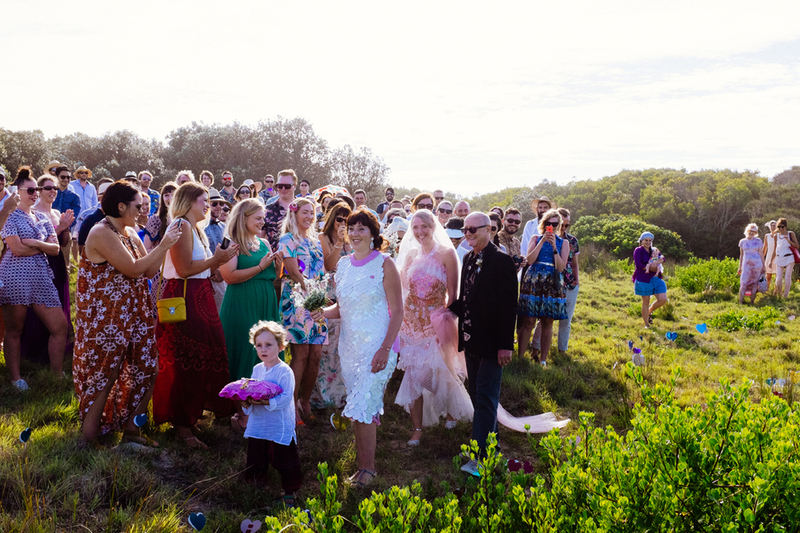 They got married in the dunes at Evans Head and it was incredible DIY feast for the eyes. 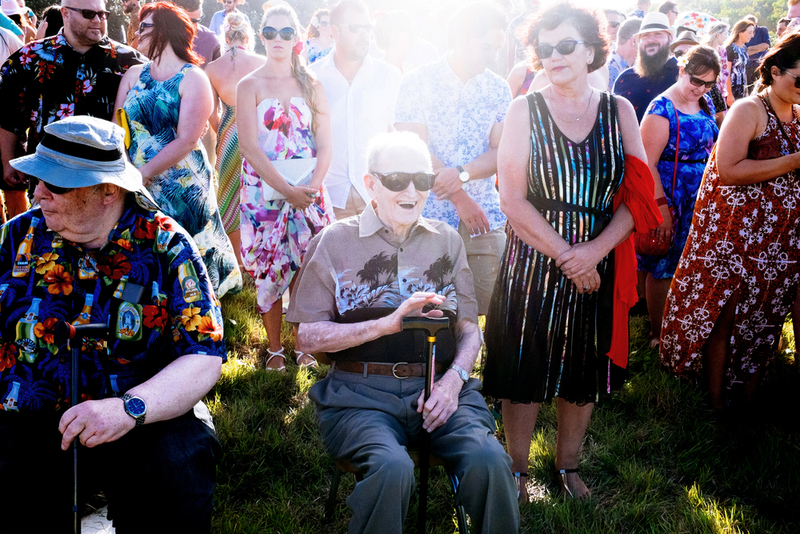 Rikki and Noodle were very generous with sharing their history and love story with me, so I was able to write a meaningful, funny and love-filled ceremony which I am still so proud of. I feel so honoured to have been the only wedding vendor there on the day, and whilst I'm not encouraging everyone to avoid engaging wedding vendors (I'm really not, I just spent the weekend at the Byron Bay Wedding Fair with such an amazing group of individuals and businesses), I was so impressed with what Rikki and Noodle and their family and friends were able to create. I asked Rikki to tell me a little bit about what they did and who helped them out. 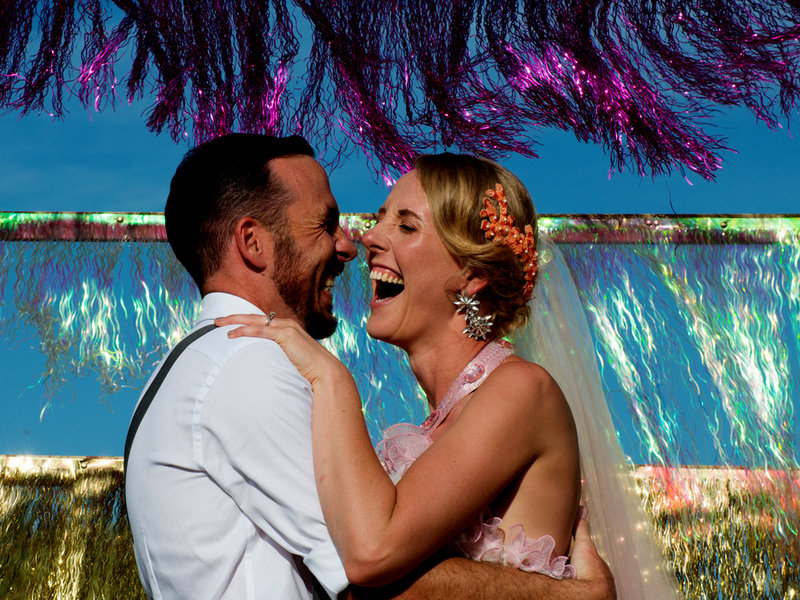 "When Noodle and I were planning our wedding we had a modest budget and a large guest list, so DIY and help from our amazing friends and families was the only way it was ever going to happen. Absolutely everything at our wedding was done by ourselves or provided by a loved-one and in the end the only wedding vendor we used was the very gorgeous Cara herself. We did everything from designing the invites, making the boutonniere's and bouquets, cutting our hundreds of glitter-card love hearts, baking biscuits and making chai tea for the wedding favours, painting signs, hand tye-dying 140 napkins, it was a definite labour of love and although it was a lot of hard work and at times very stressful, it was all worth for just how magical it felt on the day. The theme for the day was, in no particular order, hippy-dippy, surfer-dude, chilled-out, tiki-cool, under-the-sea Mermaid... plus loooootttss of glitter! My dad is a carpenter and was a massive help in creating the glitter backdrop, which was made out of Christmas decorations I found in a discount bin at Spotlight. 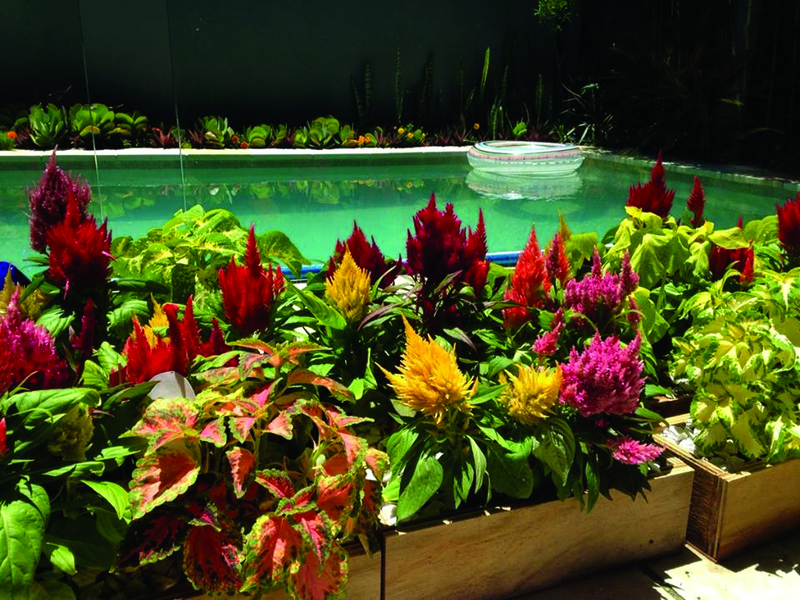 My Mum bought potted flowers from Big W and Noodle made wooden flower boxes for the tables. My absolutely legendary fashion designer friends Luke and Anna from Romance Was Born made my wedding dress for me, it was the wedding dress of my dreams, I felt like a mermaid goddess in that thing! Noodles amazing chef sister did all of the catering and if I was going to change anything it probably would of been hiring a caterer, not because Pip didn't do an amazing job, the food was awesome, but because it was a lot of extra stress to add on top of everything else. My darling friend Fran did my make-up and Noodle's mum made the wedding cake. My brother and another friend took photos and a DJ mate Barney Kato did the music. It was soooo personal and so special and everything we wanted without costing the earth." Nina and Dan first met when she was a couch surfing traveller and now they surf the world together. Nina found me on the internet, we clicked on the phone straight away and they booked me for their wedding day without talking to any other celebrants. As her and Dan live in Sydney, we had to wait until they came up to Byron Bay for a holiday, and we had our planning meeting at The Eatery on Jonson. They were both salty from just coming in from a surf. Nina is Austrian, and a lot of their guests only spoke German, so she really wanted to the ceremony to be simple and clear. She had a very clear vision for their whole day, and I was more than happy to honour that. I even got to speak a little bit of German - lebensabschnittspartner - which means "companion for a while“. In the ceremony we reflected that they had been many things to each other before their wedding day… including lebensabschnittspartner, but now they were making a commitment for life. How they met: Six years ago Nina was on a trip exploring Australia. She and her friends were on a tight budget and decided to couchsurf their way across Down Under. Nina and Dan met on day one of her trip, he turned out to be their first host and violà – a week later and they were hooked. The proposal: Nina was visiting her family in Austria and secretly planned on how she would propose to Dan ... while he was sitting in Australia making similar plans. He turned out to be faster! The day after Nina’s return he presented her a “late birthday present”– a jigsaw puzzle with photos of all their adventures and somewhere hidden was a message : Will you marry me? Their big day: Nina and Dan decided to get married at the beach, since this is a place where they spend a lot of time together. It had to be a surf spot though and Broken Head turned out to be the perfect location. They were planning a small and intimate wedding with their closest family and friends and rented a villa nearby for the reception. Nina and Dan put a lot of effort into the decoration and styling of the venue and are proud and happy what they achieved and how the day turned out. They couldn’t have done it without the help of their friends and family though! All photos captured by the supremely talented Julian Beattie. Dan and his friend constructed the arbour the morning of the wedding. He even styled the floral arrangement for the arbour!!! I was impressed - dude's got mad floral skills. Erin Gallienne did such a great job with Nina's hair and make-up. Watching a bride approach her future husband is right up there with one of the best things about my job. 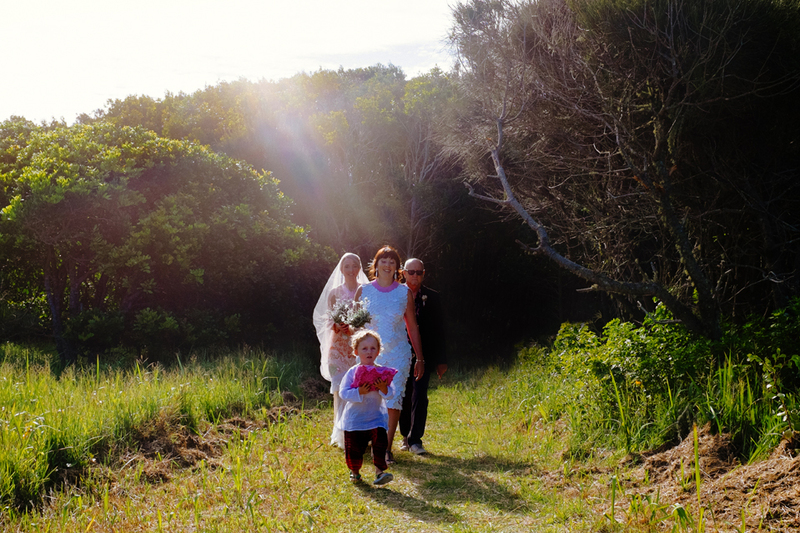 Nina's mum made her bouquet, and her father had the honour of escorting her to her groom. Dan and Nina chose to have me stand with them, but I made sure to get out of the way for their big moments - the rings and the kiss - so much better if I'm not grinning like an idiot in the background of those shots. The lovely Stephanie Grace, a young musician from Sydney, has such a beautiful voice and Nina and Dan were so happy to have her – all of their guests were amazed by her talent. 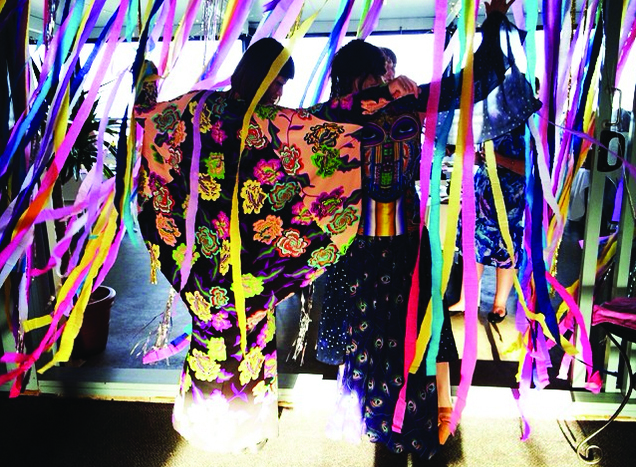 Nina is an extremely talented graphic designer, and she DIY'd the whole wedding! 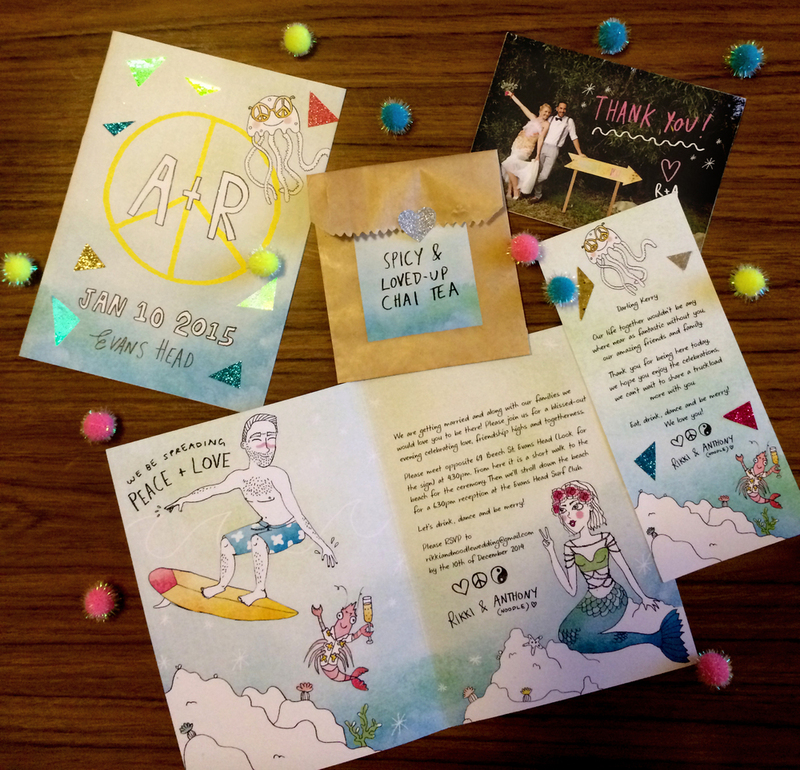 I adored the invites she designed with animated versions of her and Dan in their wedding outfits. Another of their gorgeous DIY projects was lightbulbs with the bottom cut off, suspended from string, but being used as mini vases. Anything that wasn't designed and printed by Nina, was painstakingly handmade by her - all the name tags were on brown paper, tied with string. Such attention to detail. Nina says, "Eatdrink Catering made really good food and they were such a big help on the day. They did everything to make our day perfect." The floral crown by Elyssium Blooms was exactly what Nina had dreamed of. Nina did all the chalk signage for the big day. Cake and desserts were made bySweet Obsessions.